We’ve had a very busy week here, dominated by meetings with our partner organization, the Paektusan Academy of Architecture. We are finalizing plans to get the construction underway. It’s been a long time coming, but I think that we are close to getting some actual work done. 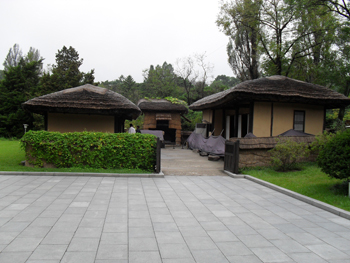 On Monday we visited Mangyongdae, the birthplace and childhood home of Kim Il Sung. His grandparents were farmers and stayed there until they died. Kim, his parents and siblings all went to China to fight the Japanese occupation—only Kim survived. We also visited the West Sea Barrage, a huge complex of levees, dams and locks that separates the Taedong River from the ocean, keeping sea water out of the lower river basin so that the fresh water can be used for agriculture. It was a monumental undertaking and was built in five years by some 40,000 soldiers. Our most important trip of the day was to Osan-Ri to visit the building site. There are 200 families living on the collective, and as a result of our work building 50 houses in addition to a government project to build another 150, all of them will have a new and decent home sometime next year. We’re building on a tree nursery collective that provides tree stock to a large part of the country. A final stop for the day was the E-Library at Kim Il Sung University. This was a project of the Paektusan Academy and took one of the original campus buildings and turned it into a state of the art computer center. Students can do research ‘online’ accessing thousands of books on terminals in a number of study rooms. Very impressive. Monday evening was set aside for a special treat—we went to the Arirang mass games performance (I shot a bit of video you can watch at the bottom of this page). This is an annual event that involves some 20,000 dancers and gymnasts. The back bleachers are a solid mass of placard-bearing youngsters who change their cards to create panoramas that provide the backdrop for the performances. It was an amazing experience. I was exhausted by the time it was over. On Tuesday we broke from our discussions to visit the Taedonggang fruit farm, a massive sea of apple trees that has grown from nothing to 1,600 acres since 2008. Big is a part of the culture here. We went to see some new houses that the Academy has been working on—very nice, very tidy and appropriate to what we will be doing. Wednesday was a holiday—Chusok—when people take food made from the first fruits of the harvest to their ancestors’ gravesites. We had a short meeting in the morning, but in deference to the holiday broke early so that Mr. Sin from the Academy and my very able interpreter, Mrs. Kim, could be with their families. Now I’m back home. The miracle of modern travel can make for a disjointed life. There are few places on the planet as different from Colorado Springs as is Pyongyang. Remarkably I feel pretty much at home in either one. The Fuller Center for Housing has taken on a big responsibility with this initiative—we may be better known in the DPRK than we are in the United States, and our partners there share our dream of building peace one house at a time. 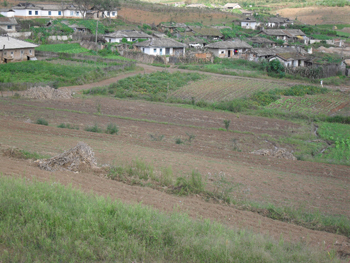 Fill out this form to apply to be part of one of the work teams to be sent to the DPRK soon. Learn more about the DPRK initiative here.